And that means: BBC you are crap! I've just seen the last ever episode of Cuffs. That was so unnecessary to cancel Cuffs! I really liked that show! Lino, Jake, Ryan, and Donna. And I really would like to know more about them! What about Jake and Simon? Does Simon tell on Jake? Do they get back together? Does Lino get fully recovered? What happens to Donna and Alice? And mostly, what happens to Ryan and his son Corey? Is Corey still snogging his friend? Oh, I would so like to know! 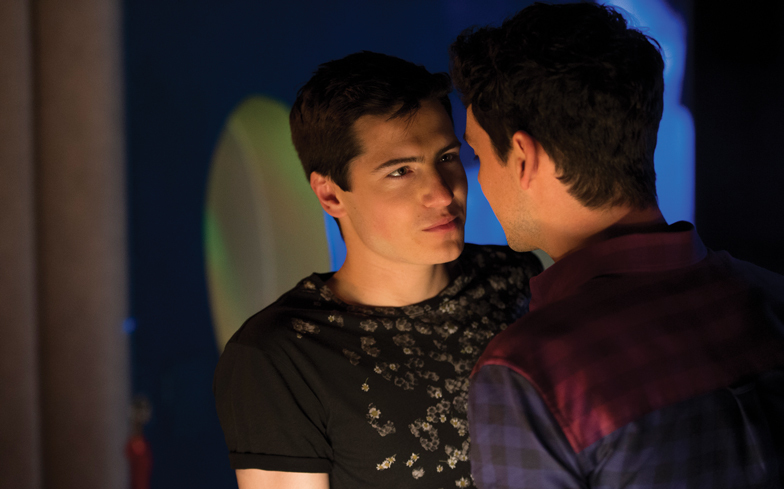 Jacob Ifan and Andrew Hawley as Jake and Simon. I would very much like to see more of Jake and Simon. All the characters are really interesting and I think it's a disgrace that Cuffs got cancelled. Shame on you! And I just wonder, how could Netflix do Fuller House and not a third season of In the Flesh, The Carrie Diaries or Looking and a second season of Cuffs?! I'm just asking. Don't make me disappointed! At least give me some gays in Fuller House! 'Cause I have to watch, just to see if it is a train wreck.